Ever since I was young I’ve loved muscle cars. I grew up in the 70’s when they were fast backed and the muffler roared past. My favorite of all the muscle cars was the 1965 Shelby Cobra. My love of the Shelby Cobra Mustang has never wavered. The phenomenon started back in 1961 when Carrol Shelby, a successful and respected member of the racing community, contacted Ford Motors wanting to breach the European market into the North American. He wanted to adapt the 2.6 liter Ford Zephyr engine into a V8. From 1961 to October 1964 they developed a new car, the 427 Shelby Cobra Mustang which underwent its first test drive in England. By January 1965, a press launch was released to the Riverside Raceway in California and production was on. It was marketed to be a symbol of that revolutionary decade. A compact and sporty car at an attractive price, aimed at the youthful starting car buyers. The original Shelby Mustang still holds the record for first year, new model sales (selling over 680,000 units between April 1964 to August 1965). 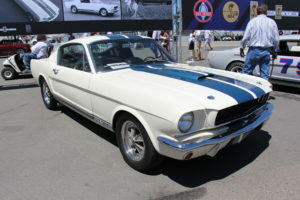 The first model which was done at the Shelby-American shop in Los Angeles, was fitted with Shelby badges and trademarks such as the Cobra logo and the name GT-350. The car released had a tubular frame with lightweight aluminum bodywork and a coil sprung chassis. It had a seven liter, 427 cubic inch V8, which could produce over 425 bhp at 6500 rpm. The top speed for the SC version (semi-competition) was 180 mph. It took only 4.2 seconds to go from 0-60 mph, what a car. Other features included a lowered front suspension with repositioned mounting points for fast-ratio steering, a steel bar connecting the front shock towers to improve rigidity and rear-traction bars located above the rear axle. These features gave the Shelby Cobra Mustang near neutral handling as opposed to other manufacturers strong under steer. They had to remove the rear seat to comply with the two-seater sports car rules in NorthAmerica, so they replaced it with a fiberglass panel which hid the spare tire. Other modifications were a trunk mounted battery, three-inch competition seat belts, a mahogany rimmed steering wheel and a dash mounted tachometer and oil pressure gauge. It has been said the Shelby Cobra Mustang started the ‘muscle car’ era. “Muscle car’ referred to the awe-inspiring, compact cars fitted with huge engines which could accelerate like small rockets, the dream of every North American boy and girl. Unfortunately the Shelby Mustang fell from grace by 1970. There were enormous amounts of accidents with the GTs, leading to high insurance rates, and cheaper, less refined cars broke into the market and took over. Today, many, like myself, consider the Shelby Mustang as a true blue, American classic. I’ve had the opportunity to drive one and the love affair took on new twist. I loved how it wasn’t cluttered with useless gizmos and gadgets like automatic brake assist and traction control, adding an excitable fear to the sound of the roaring engine. Today, the SC Mustang Cobras can reach as much as $1.5 million dollars at auction because of it’s rareness. Due to the popularity of the car, replicas have flooded the market, kit car companies produce Cobra replicas which can be fitted with a variety of engines. The author recommends http://www.tomharrisauto.ca/ when looking for Vancouver Island cars , Nanaimo cars and auto finance needs.